Past time to get this topic started. Ogie, how do you see the standings for the EDC this season? Mayville-Portland and Hazel-Beulah are playing mostly JV teams but will still be in the east and west tournaments. Unlike no. 1, 6-9 is probably anybody's guess. FSHS/Shanley return both goalies and all 6 Dman. They looked better than advertised taking down WFSHS. DL also returns their top goalie and 5 or 6 dmen, but they lost their top 3 scorers. I debated picking WF that high, but they only lost by 1 goal to both Bismarck and Century, so maybe they're stronger than I thought. Let’s give the title to Central now, save the embarrassment later. Go GFC!!! So promotion idea: Big Scoring (K)Nights, presented by Romantix. Whenever Central has someone in running time, Romantix gives away a $20 gift card for all merch except movies. "When they score big, you score bigger". Condolences to the Bernhardson family, and a tip of the cap to Dave Benson and the WF Sheyenne hockey team. Pam Bernhardson lost her “gloves-off-bench-clearing brawl” with cancer Monday. Her son Tanner, a junior defensemen at Red River High school had a home game tonight against West Fargo Sheyenne. 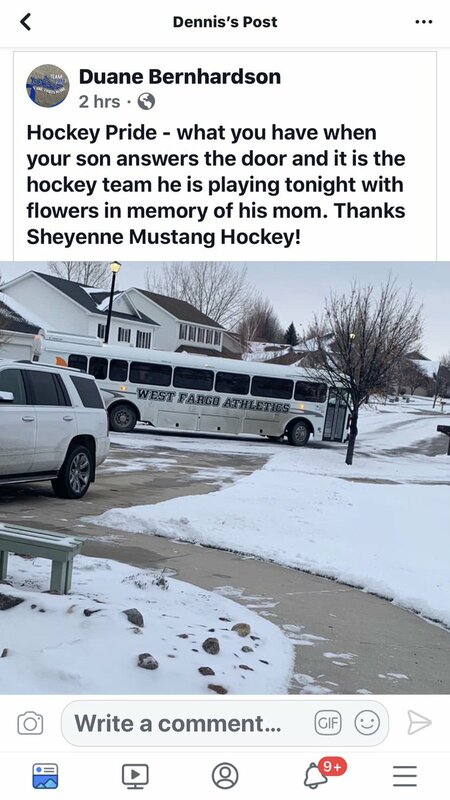 Sheyenne’s team bus stopped at Tanners house before the game. Class Act. What a class act! Hats off to the Sheyenne hockey team. Thanks for sharing. How expensive are the games to go to at Purpur? 1. Central- by a long shot unfortunately. I'm ready for the title to be up for grabs by at least 3-4 teams again one of these years. This year, we all already know what's going to happen, and it's not even a question, which makes it boring in my opinion. They just beat defending 1A MN State Champs Orono 10-0...WOW. I'm pretty confident this team would hold their own and break the top 15 in AA Minnesota this year. I'm blown away that they were able to keep Kanta and Hanson (and probably a few others) from leaving early to go play at the next level. I hope that trend continues for other teams around ND (cough RR and BISMARCK). 2. Davies- Davies is turning out solid hockey programs year in and year out. Recently they've seemed to be one step behind both GF teams but they had a little success against RR at EDC last year, and I see them building on that success by sweeping RR this season. Watch for Cade Stibbe and Austin Schmidt to be top 10 scorers in the state. They will be the only team to stay within 3 goals of GFC this season. 3. Red River- Would've been at least watchable against GFC with Montgomery and Kunz still there, but they're gone so it won't be much of a matchup. BUT RR is still loaded with talent as always, but just not an elite amount like Central has this year...again. 3rd place champs written all over them. Easily would've been my #2 pick again if they weren't drained of their talent. Both kids who left had very legitimate reasons for once. 4. West Fargo- Going on a long limb here following a 3 win season last year. They seem to be surprisingly solid and will capitalize on the EDC having a weaker middle of the pack group this season. They have a good group of young skilled forwards that seem to be off to a great start already this year. I'm just really hoping the Bismarck teams didn't provide me with false hope and make me look like a Jack-Wagon on this one. 5. Fargo South/Shanley- They return the bulk of their skill from last season and will also capitalize on a weaker mid-pack EDC this season. Sandy boys seem to be the real deal there. 7. Grafton- Grafton's tradition seems to be creeping back slowly but not quite all the way this season. They're returning some fire power and will bounce up and down the EDC standings as the season goes on, but they seem to be only a few injuries away from having a tough second half. I see them climbing to top 5 NEXT season but will have to chalk this one up to a rebuilding year. Is everything cleaned up in the Grafton+PR relationship? That has hurt them bad the last few seasons. 8. WF Shyenne- They will be in a fight with North for the 8 spot all season long, but I bet they will have a slight upper-hand. Similar season to last for these boys, but with their high enrollment, they'll probably come around in the upcoming years. 9. North- They seemed to have a tough time scoring last season but had a tendy in net helping them steal some games. This season they're going to have an even tougher time scoring after losing 62% of their scoring production...and now they don't have as solid of goal-tending either. This looks like a rebuilding year for the Spartans. 10. Mayville- Portland- Exciting to have a new team in the mix! I hope they continue to get some marks in the W column against some smaller Minnesota schools and the ND JV teams. Hopefully some success at the top will keep their youth programs growing. 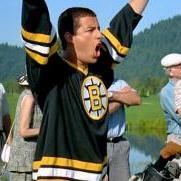 Any chance Whap/Breck makes their way back to ND? 1. Century- I see them being down this year, but still strong enough to finish off the season as #1 out west. I was pumped to see how well they would do this year by returning so many of their top players, but instead I am once again disappointed to see how much great returning talent they lost to JRs! They will drop a few random games to the likes of BHS, DHS and maybe even Minot/Mandan but will finish #1. I think Dickinson will give them a run for their money, and wouldn't be surprised if they end up #2 behind Dickinson if Dickinson can stay healthy. I don't see anyone from the west doing any damage this year unfortunately. Not even Century. 2. Dickinson- Strong season last year, followed up by a rare state tournament appearance. They played poorly and looked out of place at State, but they got that experience under their belt and returned EVERYONE. If they stay healthy I see them taking the #1 spot, but with that said, they're relying pretty heavily on 4-5 guys, so one injury is going to put a major blow on their productivity. I see a lot of high scoring games if they stack their first line and leave their 2nd line out to dry. 3. BHS- Definitely down but BHS is BHS and they will figure out a way to stay in contention. I thought Mike Peluso was out as Head Coach? Anyone know the story on what happened there? Personally I think the guy is kind of a dweeb, but was admittedly a little sad to hear he was out, but apparently that's not the case anyway. They seem to be solidly stuck at the #3 spot as DHS and CHS battle for #1 and Minot and Mandan battle for #4. 5. Mandan- They have upped their hockey appeal with new facilities, with enrollment and with youth numbers. Has anyone been inside their new rink? Does their varsity play games there, I'm assuming? Mandan has seemed to hang around 5th and 6th place for quite some time, and I think this season will be a big turning point for them. I'd love to see them beat someone out and make a trip to the state tourney. I oddly want them to return back to the Charlie Bear days (anyone?) and destroy some teams. It's great to see new teams at State, and I think Mandan is due. End in 5th for the season, but win an elimination game at WDA to get in as the #4 seed. 6. Jamestown- They don't seem to be struggling with numbers but they just continue to be a non-hockey community. Does anyone know if they still have kids coming over from VC to be on the team? Baffles me they don't have stronger hockey teams when they're getting kids from 2 Class A schools. Same goes for South/Shanley, but even worse for Jamestown and VC. They seem to produce some single studs every now and then, but haven't been very competitive recently that I can remember? When was the last time Jamestown made the State tourney? They've been in the West since 06-07, so I'm hoping they've made it a few times in that span? 7. Bott/Rugby- Are there any kids from Rugby still making that ridiculous drive? Or is this like the Devils Lake/Cando co-op that stuck around with only 1 cando kid every 4 years? Bott will get beat up for the most part but will steal a few wins this season. It seems like about every 5 years Bott has one kid putting up damn-near 100 points in a season and making a run for Mr. Hockey. It looks like Ian Amsbaugh might be the next one on that list. Wasn't there another Amsbaugh recently from Bott that tore it up? Bott is 100% a hockey community, they just don't have the numbers to produce. Especially this season! According to their roster, it appears HB has more kids out this season. Hopefully this is just a down year for them. 8. Williston- They have some younger skilled kids on the team and seem to be hanging in there. Williston used to be surprisingly good in the west every few years, but it seems Dickinson has stepped into that role in recent years. With Tyler Jundt running the program, I won't be surprised to see Williston back in the top 4 mix every few years, but it just won't happen this season. Give them a few years and let some of these younger kids get some experience and we can talk! How are their youth numbers, anyone know? 9. Hazen/Beulah- Their numbers seem to be climbing so that's always encouraging! I also see they've whooped up on some JV teams this year as well. I believe both of those communities are shrinking, so unfortunately I don't see HB climbing out of this JV type schedule anytime soon. Hopefully the kids play hard, have fun and continue getting some Ws this season! 2. Davies- Davies is turning out solid hockey programs year in and year out. Recently they've always seemed to be one step behind both GF teams. They had a little success against RR at EDC last year, and I see them building on that success by sweeping RR this season. Watch for Cade Stibbe and Austin Schmidt to be top 10 scorers in the state. They will be the only team to stay within 3 goals of GFC this season. 3. Red River- Would've been at least watchable games against GFC with Montgomery and Kunz still there. BUT they're loaded with talent as always, but just not an elite amount like Central has this year...again. 3rd place champs written all over them. Easily would've been my #2 pick again if they weren't drained of their talent. Both kids who left had very legitimate reasons for once. 7. Grafton- Grafton's tradition seems to be creeping back slowly but not quite back this season. They're returning some fire power and will bounce up and down the EDC standings as the season goes on, but they seem to be only a few injuries away from having a tough second half. I see them climbing to top 5 NEXT season but will have to chalk this one up to a rebuilding year. Is everything cleaned up in the Grafton+PR relationship? That has hurt them bad the last few seasons. Great read, Ogie! Thanks for taking the time. I agree on DL's tender; he's only given up 5 goals in 3 games so far, granted not against top tier teams, but gave his team a chance to steal one last night by only giving up two goals on 42 shots at Minot. If only they had one of their top three scorers back from last year. Orono lost everyone from last year. Last night Davies had stronger tools - more size and speed than South. Z. Sandy (Soph.) in goal for FS/Shan held his own until the flood gates opened in the 2nd period. Davies has some skill - even with the loss of Kleven. Davies will be playing in the state tourney in Fargo and have the look of a top three team out east. Whether or not they can crack the code and leapfrog RR is the question. It appears South/Shan will be in the hunt for a trip to state as a #4 seed. Let's see how the dust settles in mid-Feb.
DL steals one from grafton 4-3. DL’s goalie had 51 saves.